Chattanooga, TN... Now musicians can reap the benefits of specialized exercises performed with Eggsercizer® Hand Exercisers, from Magister Corporation, a leading manufacturer of exercise and rehab products. Ergonomically shaped to fit comfortably in the palm of the hand, Eggsercizer® can be used to strengthen fingers, hands and wrists. Specialized exercises are performed simply by squeezing the soft, smooth egg-shaped object. Eggsercizer® provides highly effective, localized exercise that can improve a musician’s finger and hand strength, fine motor control and flexibility. Eggsercizer® is also ideal for limbering up muscles in preparation for practice or a performance. The Eggsercizer® is so small and easy to use that it fits into a pocket, bag or instrument case for use any time and anywhere. 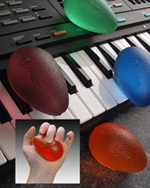 Eggserciser® Hand Exercisers are available in four color-coded, progressive resistances: Extra Soft (Orange), Soft (Green), Medium (Blue), and Firm (Plum). Professionals such as orthopaedic surgeons, physical and occupational therapists, and exercise physiologists have relied on Eggsercizer® Hand Exerciser for rehabbing and strengthening finger, hand, wrist and forearm muscles for over 10 years. In addition to Eggsercizer®, Magister Corporation manufactures a range of products for the rehabilitation and orthotic markets, including REP Band® and REP Band® Loop resistive exercise products and Cambion® visco-elastic insoles, heel cushions and heel cups.